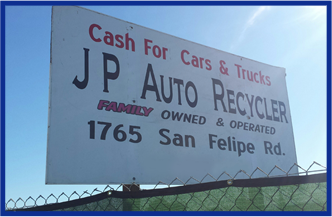 Make some money off your old car and let JP Auto Recycler take it off your hands. We pay cash for cars and trucks that you need to get rid of. Included with this service is free towing and pickup of your vehicle in question and cash paid in full right in your pockets. After our same-day service, you won't have to look at a dead and unused car on your property ever again. You can take that cash and use it toward the purchase of another car. Don't let auto supply stores take advantage of you with their steep prices. We offer used auto parts at the lowest price that can be reused for your repairs and car modifications. When you need a particular part, you can come over and pull it out of the vehicles that we have, or you can have our friendly staff assist you with extracting the parts you need. You may even find a rare component that can't be found anywhere else in Hollister, California. We'll help you locate a vehicle that has the items that you need and give you free information regarding interchangeable parts for different makes and models to fit the part you need. Call today to see if we have the used car parts you're looking for.